Oxford University Press, USA, 9780195376647, 304pp. Today there are over a billion vehicles in the world, and within twenty years, the number will double, largely a consequence of China's and India's explosive growth. Given that greenhouse gases are already creating havoc with our climate and that violent conflict in unstable oil-rich nations is on the rise, will matters only get worse? Or are there hopeful signs that effective, realistic solutions can be found? Blending a concise history of cars and their impact on the world, leading transportation experts Daniel Sperling and Deborah Gordon explain how we arrived at this state, and what we can do about it. Sperling and Gordon assign blame squarely where it belongs-on the auto-industry, short-sighted government policies, and consumers. They explore such solutions as getting beyond the gas-guzzler monoculture, re-inventing cars, searching for low-carbon fuels, and more. Promising advances in both transportation technology and fuel efficiency together with shifts in traveler behavior, they suggest, offer us a way out of our predicament. The authors conclude that the two places that have the most troublesome emissions problems--California and China--are the most likely to become world leaders on these issues. Arnold Schwarzenegger's enlightened embrace of eco-friendly fuel policies, which he discusses in the foreword, and China's forthright recognition that it needs far-reaching environmental and energy policies, suggest that if they can tackle the issue effectively and honestly, then there really is reason for hope. Updated with a new afterword that sheds light on the profound changes in the global economy in the last year, Two Billion Cars makes the case for why and how we need to transform transportation now more than ever. "Provocative and pleasurable, far-seeing and refreshing, fact-based and yet a page-turner, global in scope but rooted in real places. The authors make a convincing case that smart consumers driving smart electric-drive cars can find the critical path to a safer planet." 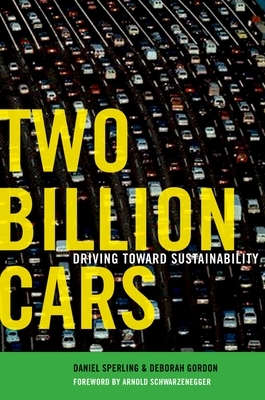 "In this insightful and persuasive book, Sperling and Gordon highlight one of the biggest environmental challenges of this century: two billion cars. They rightly contend that we cannot avert the worst of global warming without making our cars cleaner and petroleum-free. Luckily the authors also offer a roadmap for navigating this problem that is both visionary and achievable." Daniel Sperling is Professor of Engineering and Environmental Science & Policy at the University of California, Davis, and Founding Director of UC-Davis's Institute of Transportation Studies. He also serves on the California Air Resources Board. Deborah Gordon is a senior transportation policy consultant who has worked with the National Commission on Energy Policy, the California Energy Commission, International Council for Clean Transportation, and the Chinese government to develop fiscal policies for their burgeoning auto fleet. She earlier developed and directed transportation policy programs for the Yale School of Forestry and Environmental Studies and the Union of Concerned Scientists.